Multiplication and division can be difficult concepts to teach, especially if your second grade students have no prior experience with this type of thinking. It happens every year! Multiplication and division problems are fundamentally different than addition and subtraction problem situations because of the types of quantities represented. Multiplication and division are taught together so that student can see that one operation is the reverse of the other. Let's make this year different! Using the mathematical principle of unitizing and the "GET" strategy, students will build their proficiency as they learn contextual multiplication and division in the math classroom. Multiplication and Division are fundamentally different than addition and subtraction. A simple addition problem situation could be: Ann has 3 cookies. Laura have her 4 more cookies. How many cookies does Ann have now? A simple multiplication problem situation could be: Ann has 3 bags of cookies with 4 cookies in each bag. How many cookies does Ann have? The numbers are the same but the quantities represented are different. This shift in thinking is what gives most students difficulty when transitioning from the operations of addition and subtraction to multiplication and division. Second grade students need to be able to model, create, and describe contextual multiplication and division situations. What if there was something that could help bridge the gap for these students? Have you heard of unitizing? It is an important, and often unknown, math word. Unitizing gives students a change in perspective. Think back to the development of numeracy. Children learn to count objects one by one, also known as one-to-one correspondence. Instead of counting ten objects one by one, students can unitize them as one thing or one group. Another example of unitizing can be found within place value. Whenever we have 10 or more in a place value unit, we need to regroup. Thus, ten ones can also be thought of as a unit of ten. This concept of unitizing is a big shift for students. It almost negates what our students originally learned about numbers. We want to help our students achieve the developmental milestone of unitizing. Unitizing is the underlying principle that guides students' learning. 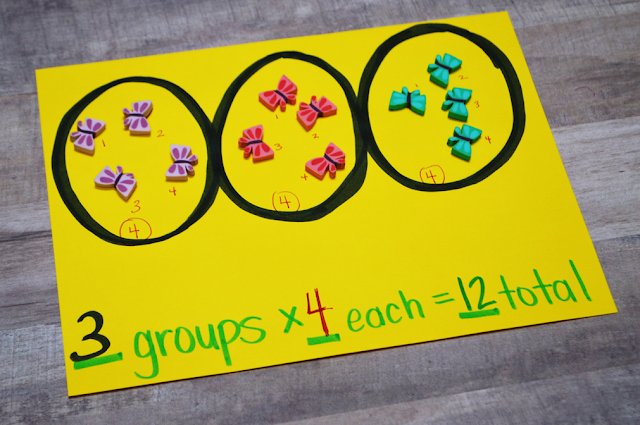 Students need to use numbers to count, not only objects, but also groups... and to count them both simultaneously. Unitizing helps students build their proficiency in contextual multiplication and division. Students need to be explicitly taught this principle and exposed to seeing it in action multiple times, much less subitizing in these primary grade levels. Show the students ten objects and tell them, " This is one group of 10." It seems simple, right? It is actually quite tricky for students to grasp, so repeat yourself...and repeat yourself. Multiplication and Division Strategy: Did You "GET" It? Another trick for tackling multiplication and division is a little-known strategy. 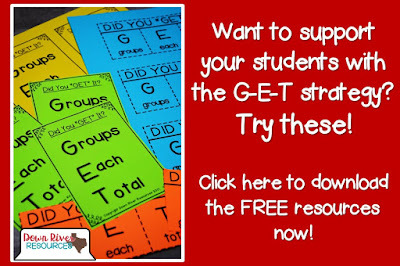 G-E-T is a simple acronym for an effective strategy when teaching contextual multiplication and division. I have used the acronym before but I added this first step which helps build students' meta-cognition. 1. Read through the word problem at LEAST once. If your students label these three parts to a word problem, it will be so much easier solving for the unknown, whether is be the dividend, divisor, quotient, factors, or product. Labeling word problems using the "GET" strategy is a non-negotiable in second and third grades! Of course, modeling and guided practice is a must before this layer of accountability takes effect! 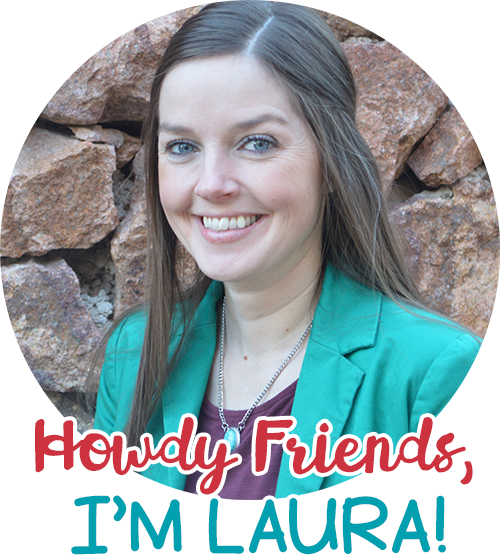 I hope this post inspires you to build your students' concept of unitizing and their proficiency with the "GET" strategy, and if you want to use my interactive math notebook on contextual multiplication and division, it's in my TpT shop. What are some ways you build your students' proficiency in multiplication and division? * References: Fosnot, C. & Dolk, M. (2001). Young mathematician at work: Constructing Multiplication and Division, NH: Heinemann.